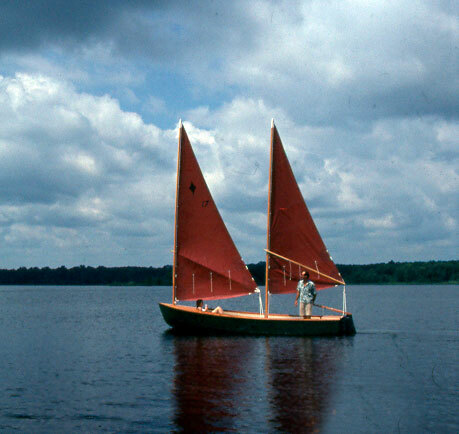 LAURIE-ANN, a 20' cat-ketch is shown here at her launching in June 2002 on St. John's River in Palatka, FL. Pat Kelly built her from a Graham Byrnes design. He used stictch and glue construction on okoume plywood. Her shallow draft, only 8" with the board up, makes her fun and fast. She planes in a stiff wind. Pat built both 22' masts in the hollow bird's mouth style using Douglas fir.